SF: Releasing a Christmas album is almost a rite of passage for a folk singer these days – how did you decide on what songs to include? ES: It was an easy decision really. I’ve been performing my Christmas show for the last five years. We started with one night at a local farm shop, New Cample Farm, where myself and Jamie McClennan were promoting concerts throughout the year. It proved really popular so we booked a tour throughout our home region of Dumfries & Galloway and now in our third year of touring we’re taking it outwith D&G for the first time this year. The songs on the record are all songs that I have gathered together for the Christmas shows over the years; I just about have enough left over for volume two! SF: There are two original compositions on the album – ‘Find Hope’ and ‘Winter Song’ – how difficult is it to write a Christmas song that says something new? ES: ‘Winter Song’ is an old song of mine, not a Christmas song as such, more about enduring the long, dark winter months – it was inspired by the first winter I spent living back in rural Dumfriesshire after several years of city life in Glasgow. I recorded it on my album Too Long Away (2008) but on the Christmas album it has been re-worked and seemed to fit in with the feel and mood of the Christmas show. ‘Find Hope’ is very Christmassy indeed, I didn’t hold back there! However, I hope it does come from a new angle in regard to Christmas songs; it’s more an observation on what Christmas means to different people. SF: There’s a beautiful version of Mindy Smith’s ‘Santa Will Find You’ on the album. Smith’s Christmas album is one of my favourites, but it’s not a particularly well-known album, so how did you come across it? ES: Thank you, I love the song. I can’t quite remember how I came across it, perhaps a google search! It’s been part of the Christmas set list since the beginning and remains a favourite. SF: With that in mind, what do you think is the best Christmas album of all time? ES: I’ve listened to a lot; the number of Christmas albums out there is overwhelming. I’m not sure whether it would be the best of ‘all time’ but I learnt ‘Heard from Heaven’ from the singing of an American group called Nowell Sing We Clear, who have recorded around ten Christmas albums – that’s pretty inspirational! SF: Traditional or contemporary – what do you think is the secret of a successful Christmas song? SF: After you’ve finished promoting and touring this album, what’s next? ES: I’ve spent most of 2016 on maternity leave, so after the Christmas tour I’ll be performing with the Ulster Orchestra in January at their annual Burns Night concert in The Waterfront Hall in Belfast. I performed with them back in 2014, which was a fantastic evening. Jamie McClennan and I mark 15 years of performing together in 2017, so we are embarking on an anniversary tour from May onwards throughout the UK; we’re working on new material for that at the moment so I’m really looking forward to trying out some new songs. 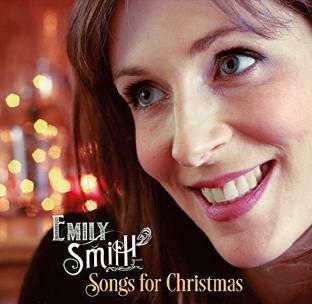 Emily Smith’s new album Songs for Christmas is out now on White Fall Records.